Brig. 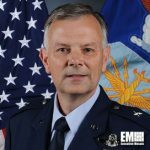 Gen. Glen VanHerck, director of operations for Air Force Global Strike Command at Barksdale Air Force Base in Louisiana, has been promoted to the rank of major general, Air Force Times reported Tuesday. Stephen Losey writes VanHerck will succeed Maj. Gen. Jay Silveria, who has been named deputy commander of the U.S. Air Force Central Command and deputy combined forces air component commander of U.S. Central Command in Southwest Asia. VanHerck will also lead the Air Force Warfare Center at Nellis Air Force Base in Nevada as commander. He has completed more than 3,200 flight hours in the F-15, B-1B and B-2A aircraft as command pilot. VanHerck previously commanded the 7th Bomb Wing at Dyess Air Force Base in Texas and the 509th Bomb Wing at Whiteman Air Force Base in Missouri, Losey reports.